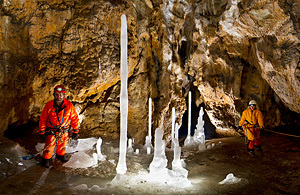 The team of speleologists descended the cave to monitor the state of the glacier. The cave is covered with ice all year round. Relict cave glacier records climate changes, keeping centuries in its memory. Also bones of cave bear had been found in the cave. Camera Nikon D3x, 12 strobes Nissin Di866. radio controls Flama. Speleologists: Igor lavrov, Bogdana Vashchenko, Alexander Chemodanov, Natalia Chemodanova, Eugenia Suzdaleva, Nikolay Ushakov. This entry was posted in Uncategorized and tagged dry caves, spherical panoramas by SnowKitty. Bookmark the permalink. Outstanding in every way! CONGRATULATIONS!